Despite standing at just 5-foot 6-inches and weighing 130 pounds, McDonnell was a baseball and basketball standout at Northeast High School and then Villanova College. But following his sophomore year at Villanova in 1943 he was inducted into military service with the Army. Although he played some service baseball, hurling a 7-0 no-hitter for Fort Indiantown Gap, Pennsylvania, against Parish Steel Company in early1944, McDonnell soon found himself in England with the 379th Infantry Regiment of the 95th Infantry Division and landed at Omaha Beach, Normandy on September 15, 1944. His regiment went on to fight battles in Northern France, Rhineland, Ardennes, Alsace and Central Europe, earning a Bronze Star, five battle stars and a Purple Heart. 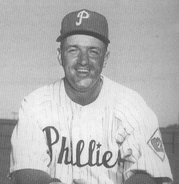 Following his military discharge in 1945, McDonnell returned to Villanova and struck out seven in a 7-6 loss to the Phillies in 1947, prompting an offer to join the team as batting practice pitcher by General Manager Herb Pennock. "You can't imagine how excited I was. Mr. Pennock wanted me with the Phillies,” McDonnell recalled. “I couldn't wait. There was a jersey, No. 45. We didn't have names on the back in those days. If someone wanted to hit in the morning, at noon or at night, I'd be there ready to throw." McDonnell was soon a member of the Phillies coaching staff and was with the Whizz Kids when they beat the Dodgers to clinch the National League pennant on the last day of the season. McDonnell said his greatest thrill was pitching two innings for the Phillies in an exhibition game. He stayed with the club until 1966, when he left to be a "goodwill ambassador" for Ballantine beer and head baseball coach at Chestnut Hill Academy. In 1973, he was enticed back to the Phillies organization joining the Community Relations Department, working as a camp instructor, stadium tour guide, and community relations speaker. He eventually retired in 2009. "All my life I only wanted to be a Phillie," he recently recalled. "I never worked a day in my life. It's been beautiful, the greatest life a man could know. I may have not made a lot of money, but what I experienced is worth a fortune." Maje McDonnell passed away at his home in the Mayfair section of Philadelphia on July 8, 2010, aged 89. Created June 4, 2006. Updated July 9, 2010. Copyright © 2010 Gary Bedingfield (Baseball in Wartime). All Rights Reserved.